Once you have purchased a Blackberry Enterprise (BES) licence and your order has been approved by our Service Transition Team, you will need to assign the licence to the appropriate user before you can configure their device to synchronize their emails. Login to https://controlpanel.cobweb.com using your administrator username and password. Click on Mobile Devices > Blackberry Accounts. You will be presented with a list of available Mailboxes. Please click on the Select option to assign an available Blackberry licence to a mailbox then click Next. You will now need to confirm an Enterprise Activation password. By default a password will have been automatically generated by the Control Panel. If required, a new password can be generated by clicking on the Generate new password button. Enterprise Activation passwords can also be set manually. However, they must also conform to the minimum password policy requirements. By default the set Enterprise Activation password is emailed to the mailbox associated with the BlackBerry license. Please un-tick the check box if you do not wish the password to be emailed to the associated mailbox. 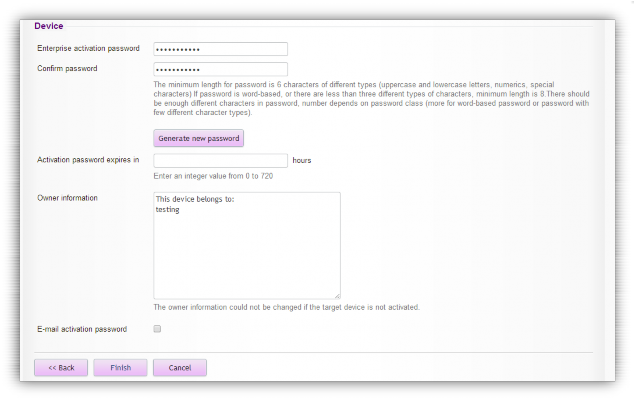 The Password expiry time can also be adjusted from a minimum of 0 to a maximum of 720 hours. By default the password is valid for a period of 48 hours. Then click on the Finish button. When the Account status field updates from Creating to Ready you will be in a position to activate your BlackBerry device.